February 2nd and 3rd - 5000 nerds overrun Brussels, Belgium, to attend Europe’s biggest Free and Open Source Developers Europe Meetup - FOSDEM 2013. So, a colleague and I decided that we had to be there too. 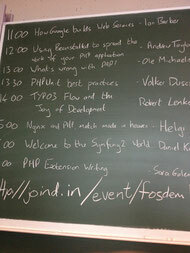 I had the pleasure of giving a talk in the PHP developer room. 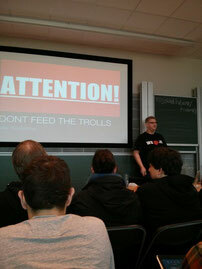 In case you missed it, here is our FOSDEM 2013 recap. We started with the opening keynote including the FOSDEM dance. Next, we planned to see How Google builds web services but unfortunately missed it, as well as some others, because of overcrowded rooms. We also missed Using Ruby Testing Frameworks to bring sanity to your infrastructure (slides) covering topics like how to mock services in a Service Oriented Architecture environment. But enough about the things that we missed! We attended a bunch of really awesome and inspiring talks! Learning to Automate (slides) was about the problems you discover when you begin to automate, or learn configuration management languages. One crucial required skill we detected, is software engineering like Inversion of Control or Dependency Injection and Single Responsibility Principle aka Software layering. Welcome to the Symfony2 World (slides) was a very good introduction to the shiny new world of modern PHP. RDFa was mentioned in combination with Symfony CMF which also looks like a cool thing for Jimdo. Funny to see what and how much the PHP ecosystem has adopted from the other language ecosystems. Engineering Resilient Systems through Cross-Disciplinary Insight (slides) gave us some super interesting insights into how to build resilient IT systems by using organizational development and culture. Essentially Agile, DevOps and Kanban promotion. We also learned about Theory X and Theory Y.
Orchestrating complex deployments on OpenStack using Heat (slided) was largely a cool screencast of a live coding session of Heat, which is pretty much an AWS Cloud Formation clone in OpenStack. And finally I also had the pleasure to give my What’s wrong with PHP (slides) talk for the very first time. 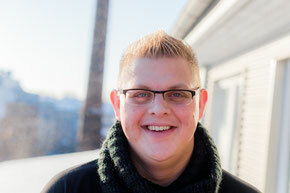 Luckily Jimdo helped a lot to make this possible! Thank you! :) I got great feedback on my talk and I was really happy when it was done - so I could really enjoy the conference (and the beer). Ohhhh and then we saw one of the most impressive talks we’ve ever seen. It was presented by Raghavendra Prabhu. The proposed topic was Feed me more: Memory appetite of MySQL analysed (slides) and it contained enough material for a full 4-day training. The speaker obviously had to be very quick, but he somehow managed to finish more or less on time. It contained so many very heavy MySQL and InnoDB internals that I couldn’t follow after 4 minutes, but we all agreed that he must be that guy who writes my.cnf on a napkin without hands while having a drink by the pool! Thanks buddy! Of course there were also lots of really cool after-party options, like the DevOps dinner sponsored by OpsCode, Puppet Labs and CF Engine. Or attending the overcrowded beer event on Friday or just hanging out in Brussels with the smartest guys in technology. We hope to see you all again in 2014!